Thoughts from an imperfect disciple. We are told that we are living in a divided nation. All the various media outlets are telling us about protests and vandalism and how the United States is no longer a safe place for minorities. One group of Americans is telling another group that they are racist and sexist because of the way they voted. The other group of Americans responds by saying they rejected a candidate who was corrupt and would further destroy the foundations of the country. The deep divisions that make up the very soul of American political life are on full display. There is no getting around the reality that there are two vastly different visions for the United States. On the one hand you have people on the left who declare that equality is the value that must guide us into the future. On the other hand you have people on the right who declare that we must remain true to the principles and traditions that the United States was founded on. Each side views the other with skepticism, derision, and intolerance. It it is a fruitless exchange as nothing gets resolved and blood pressures rise. All you want is unity, but you are told that unity is impossible because those people on the other side are terrible people. What are followers of Jesus Christ to do? As simplistic as it might sound we are to follow Jesus. It may sound simple, but it is not simple to do. There are going to be people on both sides of the aisle declaring that this or that is the most important thing and that is what deserves our attention. Many of these people will invoke the name of Jesus to try to convince us that their side is the one we must choose. When we pick a side in this political war we simple give into the hate and the division that continues to tear apart relationships, families, churches, communities, and countries. There is a better way, and that way is the way of Jesus. Unity is possible. It is the product of people who are rallied around a common idea, purpose, or person. Unity is achieved in football stadiums and concerts. People brought together because of their shared love for a team or a band. This type of unity is flimsy and cannot survive the constant threat of division. This threat comes from the powers that constantly looks to divide people into different groups. There is only one power that is great enough to overcome these wall building powers, and that is the power of Jesus. According to the Apostle Paul, Jesus is to be the rallying point that brings true unity. Jesus came to tear down walls. That can only be accomplished when we have our faith in him. Within his small group of 12 disciples Jesus had at least two men who were on the opposite ends of the political spectrum. There was Simon the Zealot who wanted nothing more than to fight against the Romans and restore Israel's independence. There was Matthew the Tax Collector who believed that compromise with the Romans was the best policy. Jesus united these men with a common purpose. Jesus rejected the politics of the world. Satan offered Jesus the keys to all the kingdoms of the world, but Jesus held fast to God's way to bring redemption to creation (Luke 4:5-8). After his miracles of healing and feeding the crowd wanted to make Jesus king, but Jesus withdrew to the wilderness (John 6:15). The crowd shouted hosanna and proclaimed Jesus king as he rode into Jerusalem, but Jesus stopped and wept over the city because they missed his true identity (Luke 19:41-44). 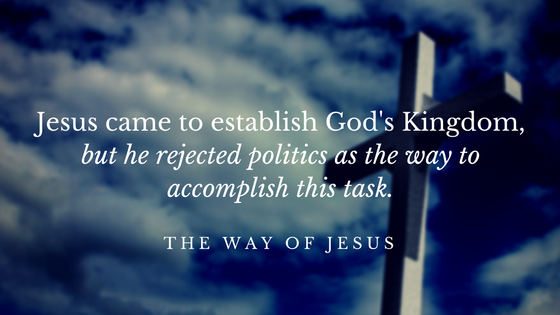 Jesus came to establish God's Kingdom, but he rejected politics as the way to accomplish this task. He called his followers to make disciples of the nations, not by the power of the sword (the true power behind politics), but the power of sacrificial love. The way for the Church to be the starting point for unity is for Christians to follow the way of the Lion, who became a lamb, who was slain (Revelation 5:5-6). We are saddened by the deep divide that exists in our country. Healing can only happen if we reject politics and follow Jesus. Will you join me? If you enjoyed this post please visit www.paulsponderings.com for more.